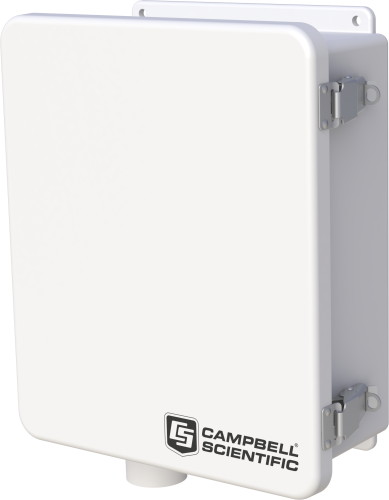 The ENC10/12 is a weather-resistant enclosure that is 10 inches wide and 12 inches tall. This enclosure can house and protect a smaller datalogger, a power supply, and a small peripheral. Or it can house a peripheral that needs to be housed in an enclosure separate from the datalogger. The ENC10/12's backplate is prepunched with one-inch-on-center holes suitable for attaching a datalogger, power supply, and a communications or measurement and control peripheral. CR1000 Although the CR1000 is compatible, this data logger can only fit inside the ENC10/12 if it is mounted vertically rather than horizontally. CR3000 The ENC10/12 is compatible with the CR3000 using the -NB option (base with no battery). Similar to the CR800/CR850 and CR1000, the CR3000 must be mounted vertically rather than horizontally. No space remains in the enclosure for additional peripherals. CR800 Although the CR800 is compatible, this data logger can only fit inside the ENC10/12 if it is mounted vertically rather than horizontally. CR850 Although the CR850 is compatible, this data logger can only fit inside the ENC10/12 if it is mounted vertically rather than horizontally. Retired peripherals that won’t fit in the same ENC10/12 enclosure as the data logger/power supply include the AVW4, AM416, COM100, CR10KD, DC1765, and RC35. What are the weight and internal dimensions of the ENC10/12? The ENC10/12 weighs 9.0 lb. Its internal dimensions are 10 x 12 x 4.5 in.